25. Miner, Earl. The Japanese Tradition in British and American Literature. Princeton: Princeton UP, 1958. 2nd ed. rev., 1966. Reprint, Westport, Conn.: Greenwood, 1976. 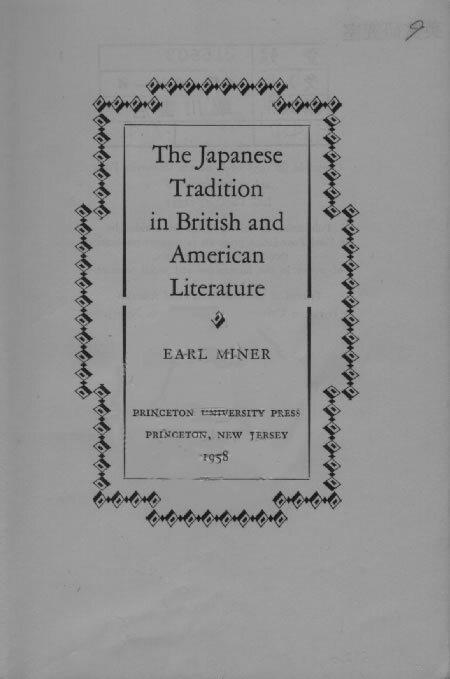 Miner’s work has defined the study for four decades, and remains the best description and evaluation of the use of Japanese materials by Victorian writers, the relation between Japonisme, ukiyoe, and Impressionism, literary inter-relations between Japanese, French, and English literature in the early twentieth century, and Pound’s discovery of haiku and its relation to Imagism. Includes ‘The Meeting of East and West’, ‘New Images and Stereotypes of Japan’, ‘From Japonisme to Impressionism’, ‘Transition to the “New Poetry”’, ‘Ezra Pound’, ‘The Absorption of Japan into Twentieth-Century Poetry’, ‘Kabuki and Nô as Dramatic Criteria’, ‘“An Aristocratic Form”: Japan in the Writing of William Butler Yeats’, and a ‘Summing Up’. Discusses the Japanese debts of Aiken, Aldington, Edwin Arnold (see CA1), Binyon, Blunden, Bottomley (CA3), Bynner, Crapsey (CA4), Damon (CA8), Eliot (CA10), Empson, Fenollosa (D10), Ficke, Fletcher, Flint, Goodman (CA12), Hartmann (D12), Hearn (D9), Hulme (see A3), Kipling (see CA1), Longfellow (see CA1), Lowell, Masefield (CA5), Moore (CA9), Noguchi (D15), Noyes (CA2), Plomer, Stevens (CA7), Symons (see BL190), Sherard Vines (Ap), Whitman (see CA1), Thornton Wilder (see also 30, 55, and BL129), and others. The preface to the second edition updates the subject, but in general terms. Translated into Japanese by Fukase Motohiro and others as Seiyô bungaku no Nippon hakken (Tokyo: Chikuma shobô, 1959); the Pound chapter, abridged, appears in German translation as ‘Vom Image zum Ideogramm’ in Ezra Pound: 22 Versuche uber einen Dichter, edited by Eva Hesse (Frankfurt: Athenaum, 1967). Incorporates ‘The Influence of Japanese Nature Poetry Upon Modern English and American Verse’, MA thesis, University of Minnesota, 1951, and ‘The Japanese Influence on English and American Literature, 1850 to 1950’, PhD thesis, University of Minnesota, 1955 (reprint, Ann Arbor: University Microfilms, 1986). a. Reviews: Miner’s work has been the subject of dozens of notes in subsequent scholarship, but received modest notice when it appeared. The most generally favourable contemporary response was that of Alfred Marks (Literature East and West 5 : 29-30), who finds the study ‘undoubtedly the most important critical work that has appeared in the near-century that comprises the term of Japanese-English comparative studies’; both Howard Hibbett (Comparative Literature 11 : 186-87) and F. A. C. Wilson (Modern Language Review 54 : 425-26) find Miner’s work commendable for its accuracy of detail, though Wilson takes exception to the treatment of Yeats; an unsigned reviewer in TLS (‘Absorbing Japan’, 8 August 1958, p. 446) commends the study as that of ‘an enthusiast who yet keeps a sense of proportion’; and Edward Seidensticker (Journal of Asian Studies 18 : 141-42) finds that Miner ‘has put together a fascinating story with great resourcefulness’, but ‘with such enthusiasm that he has perhaps overstated the case’. Other brief notices appeared in Library Journal 83 (1958): 1539; American Literature 39 (1967): 264; American Quarterly 10 (1958): 497; and English 12 (1958): 111; see also 26.